Only days remain when it comes to the winter festivities at Christmas in the Ville by the Bartlesville Chamber of Commerce building. Executive Director Sherri Wilt says Christmas in the Ville has been successful in its second year. During the first two wekends of Christmas in the Ville this year, weather made things difficult for the event. Wilt notes that they had to actually close Christmas in the Ville once during those first two weekends because of the weather. However, the weather in recent weekends has really turned the tide for Christmas in the Ville in Bartlesville. She says the Christmas in the Ville event has been rewarding over the past two years. There was also positive response to new things at Christmas in the Ville this year. Wilt says games for kids, rig backdrops and extra décor thanks to Tri County Tech have made Christmas in the Ville a little extra special this year. Whether or not they will expand next year is a different story. Wilt says the Bartlesville Chamber of Commerece hasn't had a chance to regroup and talk about Christmas in the Ville. 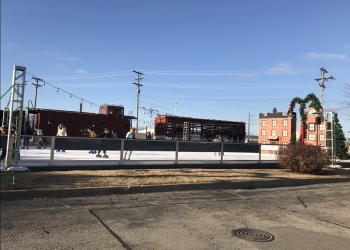 Christmas in the Ville's ice rink will be open daily from 1 to 9 p.m. until Saturday.